There are a couple different arguments and counter arguments regarding the QB situation and the need for a change. I'll try to address them in separate posts this week. I don't think anything will change, but I am firmly in the give Davis at least one, first-half series camp. I don't know what the staff is thinking or debating. So based on pure speculation, this is part 3 of the issue. "Our best offensive playmakers are Gunnell, Momah, Robinson, Purvis and Jarvis. They need someone who can throw the ball all over the field to them. Also, Haden and Harris will be bottled up without a passing threat. Crane has the arm to make the offense go." The other positions I cannot rationalize. This one I sort of can understand. We are not built for a pound away and win 13-10 team. Our kicking game is too suspect. Our special teams are too suspect. And to win in that sort of scheme, you really need a QB who won't make mistakes. In a low scoring, minimal possession ballgame, one turnover can kill you. BC tried to make Crane a game manager and play dink and dunk. It led to the Georgia Tech loss and the the first half struggles against UCF. Once they opened the offense things started clicking. Crane keeps making mistakes, but we have seen some upside. Davis might be able to operate in a ultra-conservative offense, but I think the best scheme is one that opens this up and uses all our pieces. "It's not like you have a waiver wire," said Jagodzinski, who said his use of Crane will be as much about "feel" as anything else. If the offense is functioning smoothly, Crane will stay in the game. If it sputters or the rash of turnovers continues, the Eagles could very well go back to Davis. But there are no guarantees. “I’ll tell you this. I won’t change for the sake of change, to appease people,” Jagodzinski said. The game is on ESPN U, so many of you will be forced to watch it in a bar. If you are going to watch it in a bar, you might as well make the effort and watch it with other BC fans. BC Guy Eric has also put together a google map of the game watch locations (note: some spots are not active each week). As always, leave a note in the comments or send me an email if you would like another game watch added to the list. "It's an outgrowth of the friendship and the hospitality and great times and welcoming nature Clemson brought to us," Criscione added. "We feel closer to these guys in four years in the ACC than we were to Rutgers, Connecticut, or West Virginia in the Big East. The Big East was a rock fight. Every game was a rock fight. Every team found something they didn't like about somebody else." Mr. College Football likes BC to win this weekend. HD also picked BC. In addition to Bennett's absence, it looks like John Elliott needs surgery on his back. The hockey team beat Merrimack last night. Florida QB Nico Ranieri is hoping for an offer from BC. Another Florida QB named Nico also likes BC. BC target Brennan Williams seems like a good kid. BC supposedly has interest in Maryland offensive lineman Sam Johnson, who comes from a football family. Ryan won rookie of the month honors. Jags suspended Billy Bennett indefinitely. No specifics as usual just the traditional "violation of team rules." I am sure the real reason will leak out eventually. This is not a huge loss. Bennett has a bigger leg, but our kickoff coverage has been bad with him out there. Can it get much worse with Aponavicius? Besides, this may be a good sign. The last time Aponavicius filled in for a suspended kicker, BC won! Win or lose this weekend, I wouldn't hold your breathe for a Gator Bowl invite. The city of Jacksonville is still paying for the last year's ACC Championship Game. Tyler Hudetz is still talking up BC. Nick Forbes is another 2010 target. Is anyone else having a tough time getting a handle on this game? Was BC exposed last week? Will they be refocused this week? And what sort of Clemson team is going to show up? The Tigers could be energized and ready to play spoiler or they could give up at the first sign of adversity. BC needs the win to stay alive in the division race. The past three Clemson-BC games have been classics. There is less at stake this year, but the team’s match up well and come in desperate. That should make for another interesting game. Narrative talking point that you’ll tire of by the end of the game. “Dabo Swinney has the team playing with a lot of emotion…he’s a fiery young coach.” Clemson’s interim head coach wears his emotions on his sleeve but that is not going to decide the game. After years of watching our own stoic coach, I appreciate a little fire, but TV guys (and even bloggers) put too much emphasis on it. BC has beaten Clemson strategically the past three years (using two offensive lines on a scorching day in 2005, special teams in 2006, contain, contain, contain in 2007). The winner this week will not be determined by a Gipper speech. 1. Pressure from our Defensive Tackles. Although they are healthier than they’ve been all year, Clemson is still using a patchwork offensive line. The teams that have beaten them exploited that weakness early and disrupted the entire offense. BC needs to do the same and it will start with Raji and Brace. 2. Avoid “costly” turnovers. The impact of turnovers is situational. That said, our “Pick 6s” the past few weeks have been terrible! BC cannot put the defense in a hole again this week. I believe that if we have another returned interception, we lose. 3. Vary our defensive looks. Clemson has a new offensive coordinator and plans on playing two QBs. The last thing we need is to make life easier on them by playing base D with little pressure. Mix things up over and over and keep them guessing. Don’t wait for them to make mistakes. -- Clemson hasn’t beaten BC since 1958. -- Since joining the ACC, BC is 0-3 in their games in the first week of November. -- BC hasn’t lost two conference home games in one season since 2003. BC has only played seven overtimes since the OT rules took effect in the mid-90s. Clemson accounts for two of those games. They are also the only BC-ACC games that have gone to OT. Maryland is off this week, but kickoff times and division standings provide true scoreboard watching this Saturday. While we are battling it out with Clemson, Florida State will face Georgia Tech and Wake Forest takes on Duke. We need Florida State and Wake to lose. 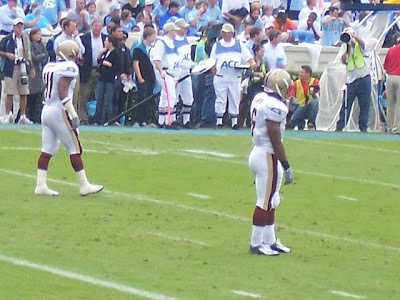 Dominique Davis on the field. I am not trying to create controversy. I believe the chatter that Davis is not ready. Regardless, I feel even a cameo appearance would help BC. Who knows what he might do, how it might refocus Crane and how Clemson will react? Clemson decides to throw 40+ times. Swinney is saying he wants to pound the ball. I think they should test our secondary. They struggled last week and Clemson has the mismatches to burn us. Let’s hope Swinney outsmarts himself. I like our advantages in the trenches. I think this game can be won with a conservative ground game and bringing a lot of run blitzes against them. I see this as low scoring with BC winning and getting back in the Atlantic race. It is only a practice video but the basketball team has a relaxed confidence. The Clemson game is becoming one of the most popular on our annual schedule. To add a little more emphasis to it, the schools will now play for a trophy. Two of BC's targets, Jelani Jenkins and Justin Brown, are mentioned in this article. BC made a good impression with 2010 recruit Conner Davis. Georgia QB recruit Drew Little is making visits. BC is still in the running for Mark Brazinski. Clemson blog Block C used to be known as DannyFordisGod. The name misconstrued their intent, which wasn't just to lionize Ford but to have the best Clemson blog around. They've done that. During this Tommy Bowden mess they've had a great mix of news, opinion and humor. BC gets the unfortunate task of facing Clemson now that they are finally healthy, rested and using a new system. No one knows what to expect. To get a better feel for the Tigers, I asked the guys from Block C a few questions. Their answers follow. 1. The offense had sort of a grab bag feel against Georgia Tech. Obviously two new player callers will do that. Do you have any guesses on what Dabo and Co. will try to do this week with the ball? What will be a point of emphasis? Block C: The Georgia Tech game can't be used as a good measuring stick for Dabo Swinney and Billy Napier (Assistant HC) in terms of offense. The entire week was a chaotic experience (TUMULTUOUS) for everyone. Less than a week is definitely not enough time to change a lot of things in the playbook, but given that they've had two weeks to prepare for Boston College you're going to see a little bit different style of football. Swinney has said that he's going to play both Cullen Harper and Willy Korn to add some confusion. CJ Spiller should be back as well after having somewhat healed from an aggravated hamstring. If we had to guess after listening to Swinney's press conference this week it would be that the Tigers are going to establish the running game and get back to the basics of football generic football cliche. 2. Everyone says the problem with Clemson is not the skill players but the offensive and defensive line. Is it that simple? Block C: Yes on the offensive side, and sorta kinda on the defensive side. The offensive line was the linchpin for our offense and that linchpin has been pulled out of the football machine, bent up, and jammed into our collective retinas. Injuries have left them as one of the most banged up lines in the ACC, if not the nation. The defensive line has had their ups and downs, but we don't think it's totally their fault. Between scattered injuries and being backed up by a very young and undersized linebacking corps, they've fared as well as could be expected. We also have a seasoned defensive backfield that was supposed to be the strength of our defense that has had to make a lot of tackles missed by our line and LBs, but has also given up some big pass plays. Our defense is starting to come around as injured players are starting to heal and younger players are beginning to understand the game at this level a little better. You shouldn't expect our offensive line to get any better as there have been some season ending injuries to some key players and our younger players just don't have the stuff to be as physically dominant as we need them to be in order to complement all the talent around them. 3. What's your take on Swinney? I thought the rah rah stuff was over the top in the Georgia Tech game (especially when he had the Punter run back on the field and run off again on national TV). Do you guys fear that if he puts together a decent run you'll end up with the next Bill Stewart/Ted Roof type? Block C: Swinney is definitely a breath of fresh air to our program. PR-wise, he's taken all the right steps to unite the team and get our fans excited about Clemson football again. Unfortunately, the season is probably too lost at this point to salvage much of anything but pride. Some of his techniques might be a bit different, but the rest of the season is one big job interview and he's been wanting something like this for a long time. He takes these steps as though he's been planning them for a while or at least mulling over what he would do differently in his head for quite some time, because he has. He stated in his opening presser that he has kept a big notebook full of knowledge he was collecting in preparation for becoming a head coach. He brings an aggressive and excited style of coaching to the table that is completely different from the shy and reserved path that Tommy Bowden took. Speaking to former players, we've heard from many that Swinney is their favorite coach that they've had in their careers. There will be a strong push to hire Swinney full time if he pulls off some wins this season, but the lure of a big name coach from elsewhere may be too strong for the Tigers to resist. There's no way to predict what sort of head coach he'd be if he were retained, however, so we'll lay off speculating on his Roofitude. 4. Since you guys don't do predictions until closer to game time, can you at least look into the future a bit? BC needs Clemson to play spoiler a bit and knock off FSU. Now that it is no longer a Bowden Bowl do you still think Clemson can beat the 'Noles? Block C: Regardless of the name, the rivalry is still there. Clemson and FSU haven't been getting along since the Danny Ford era and the famous puntrooskie incident. The game being a Bowden Bowl really has nothing to do with the outcome as the series between the Bowdens ended at 5-4 in favor of the Noles. Given this information, the game itself won't be a toss up like some rivalry games tend to be. The Seminoles look really good this year. Florida State isn't back yet, but it seems that they're very close to getting there and Clemson beating them this year might just be a pipe dream. FOR MORE ON CLEMSON, CHECK OUT BLOCK C.
BC was the first to offer California QB Peter Thomas a scholarship. A 2010 recruit, Thomas may visit for the Notre Dame game. BC finally offered Brooklyn line prospect Oday Aboushi. It sounds like the kid is still looking around. BC has interest in 2010 LB prospect Blake Lueders. Gambling experts are taking note of BC's performance vs the "over." What he fails to mention are the points coming from Crane's turnovers. The Cowboys are focusing on Kiwi. On occasion he'll probably line up across from Marc Colombo. Al Skinner is coming off his worst year since the Troy Bell turnaround. He has a solid nucleus of young returning players, some new faces and a star in Tyrese Rice. Can it all come together and get BC back in the postseason? We will soon find out. In the meantime, let's look at one of the returning players who needs to improve: Cortney Dunn. There's a lot of Dunn looks better talk around BC basketball. That doesn't mean much though because he was so overmatched last year. He barely got on the court and supposedly struggled in practices. There is promise though. Al has a way of encouraging kids to seek other pastures when their self assessments don't align with his. Since Dunn is still around and the buzz is encouraging, we can expect him to see the floor in the beginning of the season. If he holds up, he has a chance to become a regular. Good height and build on a team lacking frontline size. Can rebound. Not much offensive game. Might not have the defensive skills needed to guard ACC big men. Dunn's one of the wildcards heading into the season. I am not expecting much. If he doesn't become a contributor on a team with so few established big men, then there isn't much hope for his JR and SR years. If he can give Al ten solid minutes a night this year, then he has a future ahead of him and the team might exceed expectations. There are a couple different arguments and counter arguments regarding the QB situation and the need for a change. I'll try to address them in separate posts this week. I don't think anything will change, but I am firmly in the give Davis at least one, first-half series camp. I don't know what the staff is thinking or debating. So based on pure speculation, this is part 2 of the issue. "Crane can't be bad every game. Look at the NC State performance. He's not going to throw three interceptions every week. He's due for a good game. He's got great upside." "If I flip a coin and get heads, what are the odds that I get tails on the next flip?" The newbies try to work it out or wonder if it is a trick question. Eventually someone answers correctly "50/50." The instructor then asks "what if I flip a coin 99 times and get heads each time. What are the odds I will get tails on the 100th flip?" The point is that even if the results defy odds and averages (in this case if you flipped a coin twice you would expect one head and one tails or in the larger sample 50 heads and 50 tails) the odds don't not change on the next flip. It is independent of the previous flips. Now sporting events are not as truly independent as a simple coin flip. There are numerous variables from proceeding games that impact results (injuries, adjustments, etc.) But if you have come down to it, previous results don't change the probability of a good or bad performance. Bringing this tangent back to Chris Crane...you cannot start him on the idea that he is "due" or that he has gotten the turnovers out of his system or that he is highly unlikely to cough up the ball that many times again. He not due. No one is truly due. If due were probability, then he is just as due for another three INT day. Think of Crane as a coin flip. One side is multiple turnovers. The other is an NC State performance. Sure the upside is there, but the downside isn't going away. Now every player has their highs and lows. If we increase his sample of snaps Dominique Davis's stats could be loaded with problems or bad indicators. But we are at the point where we know what Crane's statistical range is. Hedging on him to avoid pitfalls or betting that it will all be great from here on out ignores his stats and the rules of statistics. Taking a few baby steps with Davis at least changes all they dynamics a bit and allows BC to explore alternatives. To close with a clumsy analogy, mixing in Davis is like BC going from its risky Crane coin flip to rolling a six-sided die. It mixes things up. Let's roll. Later in the week I'll get into the offensive limitations argument. Our defensive line is racking up the medical bills. Jerry Willette had his knee scoped and will be out for Clemson and possibly Notre Dame. Nathan Gerbe's new teammates welcomed him with a little teasing. Doug Bell and Charles Arbuckle will call Saturday's game. ESPN profiled a hot young QB prospect from Massachusetts...who is only 14! Seems like folks are jumping the gun a bit. It will be interesting to see if BC gets involved with his recruiting. Florida DE prospect Victor Gray has good things to say about BC. Delaware LB Paul Worrilow didn't like his offers out of high school, so he went on to Junior College. He just visited Arkansas and is supposedly hearing from BC. BC is recruiting basketball player Dontae Johnson for football. Harold Spears is another two sport star BC is recruiting. Although he doesn't talk much about BC Eugene Smith might still take an official visit. The game will be on ESPN or ABC at 8 pm. Do you think the fans will be fired up a bit? We haven't played the Irish in prime time since 2001. There are a couple different arguments and counter arguments regarding QB situation and the need for a change. I'll try to address them in separate posts this week. I don't think anything will change, but I am firmly in the give Davis at least one, first-half series camp. I don't know what the staff is thinking or debating. So based on pure speculation, this is part 1 of the issue. "Davis is not playing well in practice and is not ready for the toughest part of the schedule." Ultimately it could be as simple as this. None of us are in practice. Davis might be hitting guys in their shoelaces or floating passes ten feet over their heads. He may have poor practice habits. He might not be learning. He might be a disaster ten times worse than Crane. But, he's all we have. The staff has deemed him the next best option after Crane. They want to keep Tuggle's redshirt. Crane's play dictates that you try something else. Even if Davis is the worst practice player ever with a thin understanding of the offense, you take a shot. Some players perform differently when it is game time. Some rise to the occasion. Plus getting him out there forces the other team to adjust and prepare for two QBs. Even if the staff thinks he is terrible, Clemson, Notre Dame and Maryland don't know that. They just see another tall athletic QB across the line. If Davis gets out there and looks terrible or turns the ball over, you put him back on the bench. One turnover is not going to be anything worse than the mistakes that Crane has made. Later in the week I'll get into the Crane upside argument. I wanted to keep BC ranked but couldn't justify it after the beatdown. I still think Georgia is the best one-loss team out there. Now watch them go get destroyed by Florida. I also gave love to UVA. Despite their rough start, they deserve respect. They just beat two teams solid conference foes. Dropped Out: Georgia Tech (#10), Pittsburgh (#13), Kansas (#20), Boston College (#21), Northwestern (#23). Thanks to BC Mike for providing a few pics of Saturday's disaster. The Globe and Herald both filed "turnover" centered stories today (Globe, Herald). The damage of turnovers is situational, but it doesn't take genius to figure out that the ones the other teams runs back for a score are the worst kind. That said, turnovers were only part of the reason we lost. The ACC basketball writers predicted an 11th place finish for BC. I am not expecting an ACC title but I think this team will be competitive. HD bumped BC down a bit in her power rankings. Can't say I blame her. Peter King recognized Kiwi's contribution to the Giants D. Glad to see Kiwi fully recovered. BC has interest in Delaware running back Brian Fields. BC has already offered 2010 recruit Aramide Olaniyan. The good news is that watching back I didn’t feel as bad about Chris Crane’s performance as I did yesterday. He was still bad, but I don’t know if we win that game with Matt Ryan. To emphasize my point, I would say the best and most consistent players this season have been Herzy, McLaughlin, Tennant, Gunnell and Castonzo. All of them made major and costly mistakes yesterday. I also think our coordinators didn’t do us any favors. The Pollyanna in me still has optimism. We just need to play much better down the stretch. The good news, Crane only had six really bad throws. Of course three of them turned into costly INTs. Crane also pressed in the second half and had some of his deer in the headlights moments on broken plays. He also held onto the ball too long and floated some of his deep balls. The good news: his short slants into single coverage were good. His outs into single coverage were good. He ran the two minute offense well at the end of the half. Crane’s major, major problem is that he still locks into receivers. He never scans the field or looks off. When a team like UNC is dropping seven and eight, Crane locking in leads to disasters. Crane’s decisions off of play action are a mess too. Since he has less time to scan the field he turns and throws (poorly). As for what to do (and this will be discussed more this week): I am firmly in the play Davis and Crane in the first half of every game camp. I understand that Davis limits the offense. The fear is that the aerial attack is shelved with the redshirt freshman. Even if it does take away the deep ball, I think getting Davis on the field at least provides a change of pace and forces the D to prepare and play against two QBs. Harris and Haden both had decent games. They both had a few strong runs and also got gobbled up a few times too. Both were involved in the passing game but neither broke anything. McCluskey had the most impressive day from the backfield. He had eight catches, most were late in the game. Sure North Carolina was giving him the short stuff, but McCluskey was getting positive yardage after each catch. He was also running hard. He was one of the few gamers yesterday. The offensive line was very inconsistent. Ramsey was the only guy who didn’t have a bonehead play or make a major mistake. I’ve been leery of Tennant’s snaps out of the shotgun since the URI game. Saturday it finally proved costly…and on a third down. Tennant’s blocking was good. By my count Castonzo only got beaten once in pass protection. However, he had a few rough spots in the run blocking. Remember that one play when Marvin Austin horse collared Harris on the counter? Castonzo had a shot at Austin and tripped up over himself. Lapham had trouble with the inside speed moves and also tends to get locked up when you send two rushers right at him. Rossi had trouble with speed as did Claiborne. One of the reason I think that Logan probably didn’t run the ball more is that our run blocking was not sharp. This was the lines worst performance of the season. Rich Gunnell was another guy who had some uncharacteristically inconsistent day. He alligatored armed a critical third down pass. He had two drops. There was also the catch that the refs ruled as out of bounds. It may have been a bad call, but Gunnell also has to be aware of where he is. Robinson had a decent game. Momah and Jarvis were both decent in the red zone. Megwa had a nice catch. Larmond needs to do a better job blocking. His passive effort got Crane pounded on one of the QB runs. Purvis had some really nice catches but failed to break any tackles. I love Steve Logan but he did not have a good day. I guess my problem – and I am not sure if these even captures my concern – but I get the feeling he’s too willing to give up on the run. We only ran the ball 19 times for 58 yards. Clearly not effective. But sometimes you stick with it just to take advantage of what the defense is running. Who knows when a play will break. Where was the QB option or the QB dive/read thing (the play were Crane reads the end and either keeps it or gives it to the RB to follow the stretch block)? Both might have forced an adjustment. I also question not going deep more often. Like VT, the DBs were just sitting in their zones jumping Crane throws. Why throw slants and posts into the teeth of that? Have some more patterns that call for double moves. Throw some more Gg’s that might stretch and move the safeties. It is almost as if they said dinking and dunking worked against NC State so we should try it against a very similar scheme at Chapell Hill. Unfortunately the Heels have much better athletes than NC State. Some might think that we missed Brian Toal. I would have liked to see Toal out there, but the guy we are really missing is Alex Albright. Our current DEs are serviceable but cannot close on a QB. Ramella and Giles did a decent job getting past the UNC line during passing plays but often lost contain or just plain got outrun by Sexton. Brace and Raji both had strong games. They did a great job disrupting the UNC line. Brace probably had his best game of the year. The second teamers (Willette, Scafe, Ramsey, Newman and even Deska) played well. They should have had more reps. Unlike Brace and Raji, Herzy and McLaughlin had off games (for them). Herzy was still very productive and active, but missed a chance to stop Nicks’ final TD of the first half. McLaughlin was also guilty of some bad tackling – the shoulder to Draughns was the pefect example. In fact the tackling was as the worst of the Jags era. Francois did well in place of Toal and was very active. The second team guys did not get on the field until late in the game. My fear is that the lack of rotation is wearing down Herzy and McLaughlin. I hope the back ups get on the field more against Clemson. They went after Gause early and exploited the cushion and his gimpyness. To his credit he adjusted and did a much better job as the game progressed. Fletcher also did a decent job, however, his run support wasn’t as strong as it has been. Rollins had a really rough day. He was overmatched against Nicks and struggled tackling. Akins had a good day – especially when blitzing. The announcers faulted him for the second TD allowed, but he really should have had some help from Bowman. Akins might have been the best performer of the day. Anderson struggled. He missed tackles and also need to make a play on some of the deep balls. You know who had the best day? Quigley. His punts weren’t boomers, but he did a good job of getting the numerous punts off under heavy pressure. The punt coverage was adequate. Gunnell not only didn’t make anyone miss this week. He also bobbled a punt. Once again, not his best day. Jeff Smith might be fast but he is not a natural football player. He runs into traffic, doesn’t adjust well and often slows as contact approaches. What really frustrated me was they’ve now paired him with Harris on the returns. Harris was waiting for him to field the kicks and then they took off together with Harris in the lead (as he should be). Harris would run to daylight and Smith wouldn’t follow! Instead he ran towards guys in blue. This happened twice! Now following Harris may have only meant an addition five or so yards, but you never know. The kick coverage was poor again. The opposing returnmen get to run free for a good ten or fifteen yards before anyone even gets in the picture. Jags also took the blame for the squib at the end of the first half. UNC’s quick TD was a killer going into halftime. There was plenty of blame to go around. Credit also goes to UNC. They played a strong game in all aspects. They also didn’t fold when they were down 10-0 early. Now the team has to lick its wounds and find out what works. Regardless of how Jags justifies it, something needs to be done regarding Crane. (I’ll have more on that this week.) The gameplan either needs to be tweaked or we need to mix Davis back in. Something. Anything because the season is on the brink and I fear that another shaky performance could lose the team and lose our shot at the division. Jags has pushed the right buttons in the past. He needs to do it now. Every unit looked bad but having "bad Crane" without the good one was probably the deciding factor in the second half. For those who pay attention to these things, that was BC's most lopsided loss since the infamous Syracuse game. Now the margin of error within the division is gone and our QB remains a major liability. I'll have grades and second-viewing thoughts up late Sunday. This game might not change the Atlantic landscape, but it will serve as a good measuring stick. Let's go get the win. I will not be online during the game. Leave your comments below. The New York Times has a great Q&A with Mark Herzlich. He touches on football and many aspects of being a student athlete at BC. He's a real credit to his family and the program. The hockey team beat Vermont last night. This article rehashes last year's disappointing college basketball season for all Boston area schools. Hopefully things are different this year. BC Guy Kevin Armstrong wrote a nice piece on B.J. Raji at SI.com. BC is targeting Michigan commit Dewayne Peace. Brennan Williams likes BC bust doesn't think he'll use one of his "official visits" to a school in his own backyard. Davon Custis lists BC as his leader although he is visiting Notre Dame. Al Skinner is coming off his worst year since the Troy Bell turnaround. He has a solid nucleus of young returning players, some new faces and a star in Tyrese Rice. Can it all come together and get BC back in the postseason? We will soon find out. 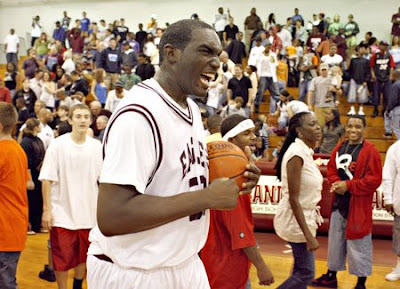 In the meantime, let's take a closer look at one of the new pieces: Evan Ravenel. Ravenel was a late bloomer who gained a little more attention as a high school senior. Unfortunately not all of the attention was good. Ravenel was suspended for three weeks last January for getting in the face of an official. He's a bit undersized for a big man but uses his body and weight well. Because of our lack of depth on the frontline he could be thrust into the regular rotation. He is a good rebounder. Supposedly has a good work ethic and motor. Better athleticism than you'd expect from a guy of his build. Still raw offensively. Will be asked to guard bigger men throughout his career. Ravenel was featured in this "dunk of the day" last fall. He's not exactly skying like Sean Williams, but he's graceful. I don't expect Ravenel to be a starter or even major contributor this season. However, unless Al goes small and up tempo on a regular basis, Ravenel will get some minutes. We don't need points from him...just rebounds, rebounds, rebounds. If he shows he can bang in the ACC and improves his post skills a bit, there could be decent upside for him at BC. It doesn't get much simpler than this week's rooting guide. We need division rivals to lose! Wake Forest at Miami. Miami. Wake's loss to Maryland gave us a little breathing room. If the 'Canes pile on Wake might not even be in the division race by the time we play them. Duke at Vanderbilt. Duke. Part of me wants to see Duke lose. It makes BC's life easier if they are permanent doormat, but a ACC win over an SEC team helps. NC State at Maryland. NC State. No one likes to root for TOB, but a win here would help us out big time. Maryland tends to play down to their competition so this game could be a close one. 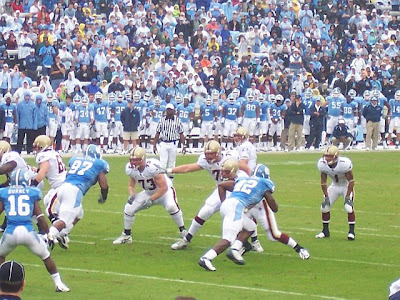 Virginia at Georgia Tech. Georgia Tech. I want GT to do well since it makes our one loss look better. Virginia Tech at Florida State. Virginia Tech. This is obvious. A VT win makes our win over them look better and it knocks Florida State down in the division race. Another regional coverage game, so more those not getting the broadcast it means Gameplan, 360 or a BC Game Watch! These are the organized watches I know of. As always, email me or post in the comments if I've missed any. John Oates signed with the Manchester Millrats of the Premier Basketball League. Not the NBA but it's a paycheck. The Philadelphia media is all over they Ryan back to Philly angle. Their defensive coordinator is comparing him to Peyton Manning. (Thanks to Enrico for the link.) This article includes a confident quote from Ryan's high school coach. Tony Barnhart thinks UNC is going to win. BC recruiting target Joe Boisture is getting more attention. In the notes section of this article, it mentions Newman and Giles nagging injuries. Both will play, but we are starting to get thing at DE. Wonky football warning! Brian at Mgoblog has a nice breakdown of the Center's duties in this zone run. 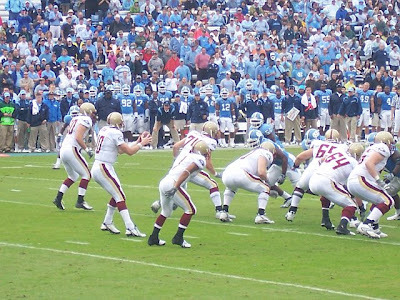 The blocking scheme is very similar to many that BC uses in the course of the game. Brian shows how hard it is for the Center to get across his man. We're lucky in that Tennant is very good at this and has been from the day he started. This is actually the least important game left on the schedule. The last four intra-division games have far greater implications on the standings and bowl positioning. Notre Dame means a lot for entirely different reasons. This would be a nice win and another boost, but won’t determine much beyond bowl eligibility. Of course, we still need to win. Narrative talking point that you’ll tire of by the end of the game. “Chris Crane has really come into his own.” When Doc Walker is not getting sidetracked by the Tight Ends or his homespun and unique descriptors, he and Steve Martin pay an inordinate amount of attention to QB play. Even when things were falling apart against Georgia Tech, they were still giving Crane some praise. Since the last game BC game they did involved Chris Crane’s career day, expect them to continue to heap praise on Crane regardless of how well he is play. 1. Stop the run. It is pretty straight forward. In their wins UNC is averaging 124 net rushing yards. In their losses, they average 99 net rushing yards. Since Sexton came off the bench they are even more dependent on the run. BC needs to slow down their running and contain Draughn. 2. Interior offensive line play. As we heard from our guest blogger, Carolina is not going to bring heavy blitz. If they get pressure it is going to come from their DTs, especially Marvin Austin. Our inside guys (Ramsey, Tennant, Claiborne) need to have strong performances and give Crane time. 3. Second half rushing. When ND went pass happy against UNC, the Heels adjusted and shut Notre Dame down. The Irish couldn’t run the ball. When Virginia Tech slowed us this past Saturday, we had mixed success running the ball. We moved it and killed clock but did not score. This weekend I expect to follow a similar pattern between the teams. BC passes early. UNC adjusts. To win BC will need to run effectively in the second half. North Carolina is the only ACC team BC has not defeated as a member of the ACC. The most important game for us is Virginia Tech-Florida State. First, we need FSU to lose another conference game. Second, it should tell us more about VT. FSU is very much like BC: similar offensive scheme, error-prone QB who runs, and solid D. If VT handles them, it will be a good barometer on our own victory over the Hokies. BC get back to forcing turnovers. Turnovers can be one of the most misleading stats in football (penalties are another). Regardless of their importance, I would like to see the momentum swing a little in this category. A couple of drive stoppers could go a long way towards BC winning. We need to kick a late field goal. Getting blocked last week and seeing Jags continue to go for it is an indictment against our FG unit. I think this will be a close game. Hopefully any critical field goal is a chipshot. When forecasting the season, I kept penciling this game in as a loss. As I expected North Carolina is greatly improved. That said their recent injuries and style of play have me in a much better mood. I don’t think you’ll see the fireworks for last week. I expect a more conservative, defensive game with BC prevailing. All three beat writers went with a Francois article today. It is the right call. Unfortunately they all went with the same story and the same quotes. (Globe, Herald, and Daily News Tribune). HD keeps picking against us. The ACC is saying goodbye to Boise. BC has shown interest in Upstate New York product Capone Smith. In his latest mailbag, Stewart Mandel addressed the issue regarding Big XII defenses. In an effort to prove that pace of the game impacts stats and therefore total defense, he decided to use yards per play as a equalizing measurement. He then showed that Oklahoma and Georgia have similar yards per plays stats (4.59 and 4.58 respectively). He also compared Oklahoma State and LSU (4.88 and 4.84 respectively). The stat got me wondering...BC is fourth in yards per game and 10th in points per game. Does the yards per play undermine that? Is BC not as good as Oklahoma or Georgia? A quick calculation reinforced BC has a very good defense. Even with new fangled stats, our D is better than most averaging only 4.09 yards per play. Another preview of the game. Dr. Saturday moves his ACC focus to Georgia Tech. I am glad he is bypassing BC, as his column has been a bad omen for the team in the spotlight. Despite my efforts to debunk it, HD buys the "rookie" arguement. BC is moving up various ACC Power Rankings. Jake over at Tar Heel Buckeye grew up an Ohio State fan, but wisely chose to go to an ACC school. In preparation for this weekend's game, I asked him a few questions about the Heels. His answer follow. ATL_eagle: Sexton's numbers have been decent but not game changing. How much of that is him and how much is due to the scheme? Is there a chance Paulus will come off the bench this weekend? Tar Heel Buckeye: The coaches don’t seem to be giving Sexton the same down field throwing opportunities that they allowed T.J. Yates. The few (and I mean two or three) chances he’s gone deep he’s overthrown wide open receivers. Sexton definitely can manage the game effectively as he had only thrown one interception heading into Virginia. It was obvious that Virginia’s defense was getting to him as he made two uncharacteristic throws—one on a screen pass where he completely ignored the defensive lineman (hello?). Scheme wise, I think the coaches are trying their best to give Sexton easy throws like slants, hitch routes and halfback/fullback passes. This is where Elzy’s injury is key as he was one of those safe check down routes that churned out big yards. The Heels don’t have another fullback/halfback hybrid to be a huge receiving threat. Another thing that has probably kept down Sexton’s numbers is the emergence of a running game. Shaun Draughn, a converted safety, had 138 yards on 30 carries against Virginia. This guy seems to be getting better each week and the 1-2 punch of Draughn and big Houston has taken the pressure off of Sexton. A monumental collapse would have to take place for Paulus to come in. If it looks like Sexton is giving the Heels zero chance to win then I would expect to see Paulus. After Paulus’ debacle against Virginia Tech and Sexton’s Miami, UConn and Notre Dame victories, it will be tough to take his place. One interesting thing is how personal Sexton took the Virginia loss. He was quoted as saying he felt like he let the whole state down and all of the fans with his turnovers. I don’t expect him to play that poorly against BC. ATL_eagle: The defense has intercepted many passes but have also given up a lot of yardage. Is it a bend but don't break scheme and wait for mistakes or more risk taking? How do you think they will attack Chris Crane? 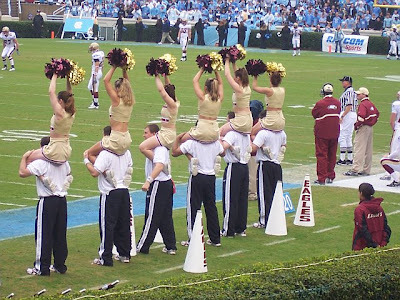 TB: Whatever you do, do not mention the “bend but don’t break” scheme to a Carolina message board. Good lord, I’ve never seen more people flip out over one loss. The defense had success playing with 3 lineman and 8 men in coverage against Notre Dame. The Heels knew Notre Dame would be pass happy, but Notre Dame ended up running all over this scheme with 4 wide outs and a running back. The Heels did not blitz for what seemed like the whole game, but Clausen made several mistakes and Notre Dame got behind so they couldn’t run the ball. UNC used this same scheme in the late drive against Virginia. As the world saw, the Heels played not to lose. The philosophy is that the other team will make a mistake whether it’s a pick or a sack before you blow a coverage. It’s worked in some games and failed in others. 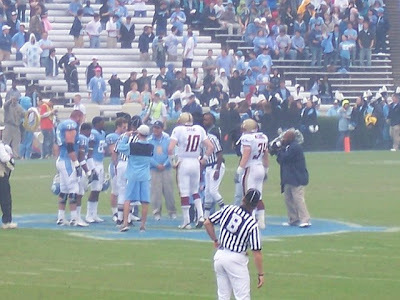 The Heels did blitz against UConn on running downs and some against Virginia in order to stop Peerman. I expect to see some blitzing maybe on first down, but Carolina will probably continue to try to force the other team to make mistakes. Bottom line: Don’t expect the Heels to bring the house on third down and long. They haven’t shown it all year. With 300 pounder Marvin Austin at DT it seems to be working with the exclusion of the Virginia game. ATL_eagle: The perception is that Tar Heel fans are passive about football even when times are good. How true is that stereotype that basketball is all that matters in Chapel Hill? TB: I think it’s fair to say that Carolina fans have been passive about football in the past, especially the way the last two seasons have gone. But even last year Butch Davis really started changing the culture and the home games were rocking. The home games are packed and the student section is being named up there with some of loudest in the country. The atmosphere for the Notre Dame game was electric. Let’s just say Butch knows how to get the fans’ juices flowing with the pregame atmosphere. No, it’s still not equal. How could it be at this point? But Carolina fans are beginning to take football seriously. The culture is changing and the potential for football at Carolina is sky high. I don’t think it’s a fair assessment to say that this year our fans are passive about football. It’s a great balance, though, because our football crowds are much more electric than our basketball crowds. In basketball, we expect to win and we sit back and sip our wine and eat fine cheese, but in football we have that new, fond feeling of accomplishment, especially with the way this season is shaping up and based upon next season’s outlook. ATL_eagle: What is your prediction for Saturday? TB: Oh gosh, I haven’t gotten down and dirty with the number crunching yet. 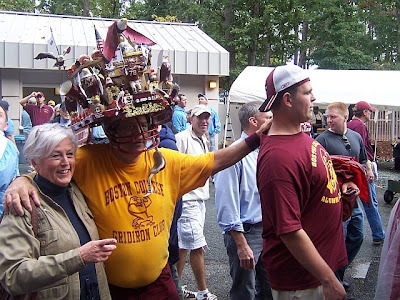 My gut feeling is that Boston College will escape with a victory—maybe a three or four point game. BC is quietly looking like they could win the Atlantic even with the tough schedule. After talking about basketball, I can’t help but recall three seasons ago when Hansbrough was a freshman and the Heels lost to BC in the ACC tournament by three points. The Heels were young and inexperienced, but their talent had begun to show and they were playing like they could beat anyone (they had just beaten #1 Duke at Redick’s senior night). Now, I know we just lost to UVA, but I feel like this game is along that same path. I feel the same about this year’s team—next season the experience and depth of the team will allow them to compete for the ACC title, but not this year. The injuries are mounting and the Heels lack an explosive presence. The lack of a big playmaker is beginning to show and Sexton’s inability to really carry the team down the field with his arm will be evident. Carolina’s secondary will likely make a big play or two, but the inconsistency on offense will plague the Heels. I think Crane will throw an interception or two that will keep the game close, but BC should be able to move the ball more consistently than the Heels, especially with Harris turning out over 6 yards per carry on the ground. Watch out for Shaun Draughn though—his play could be the difference in this game as neither team has the greatest rushing attack. For more UNC talk check out Tar Heel Buckeye. Some bloggers consider Rice one of the top guards in the country. I usually don't link to articles in the Heights, but thought this one on Montel Harris had two good nuggets: 1. Jags weighing and measuring him in the office 2. rooming with Herzy during the summer. The Jags story shows the coach's sense of humor and willingness to recruit a kid that others viewed as an afterthought. The Herzy things shows how you reinforce the current culture around the team by having the freshmen room with the team leaders. Here is a preview of the game. Remember Kenny Plue? He was the BC commit who headed to prep school after the coaching change. He's now starting at Purdue. Good for him but I don't think BC missed out on anything. Purdue's style of oline is almost the opposite of ours. For reservations please call: 1.800.225.2008 or go to the Boston Park Plaza Hotel & Towers website. How does Chris Crane compare to other "rookie" QBs? Chris Crane has now started seven games. Jags and Logan will tell anyone listening that Crane is a rookie. This explains some of his struggles but not all. As a comparison, just look at BC last four QBs and their first seven games. Let me address a few things, before we get into the results. -- W-Ls are most important and I think we all acknowledge that defense and scheduling play factor into the hot starts of most of our recent QBs. -- I only counted games started, which hurts Crane and Porter. Both of them came into their starting run with much less playing time than St. Pierre, Peterson and Ryan. -- Crane is operating out of a different offense and a different offensive philosophy than the previous four QBs. Crane is clearly the most reckless (or error prone) QB to see the field in nearly a decade. He offsets some of the carelessness and poor decisions with his running ability in the red zone. His accuracy and productivity chart closer to our lower performing QBs rather than our top guys. He’s a rookie, but the upside is probably not where we want it to be. Excusing his poor play due to his inexperience makes for good spin. It is not the sole reason for his struggles. Regardless, Crane is supported by the best group of receivers we’ve had in this time period. He’s also got a better D and better offensive coordinator than his predecessors. He’s good enough to get us to Tampa. We just need him to be slightly better than he has been. Raycom, ESPN U, and ESPN: what's the story? In the comments section on my prior post LA Eagle voiced a gripe that many BC fans have had this year: "what's with all the Raycom and ESPN U games this year?" It is really not BC's fault. It is more a product of how things work. As part of the ACC's deal with ESPN, ABC/ESPN get the first two selections of any ACC home games. One is for ESPN. One is for the 3:30 regional game on ABC. Raycom gets the third choice. After they select, the rights revert back to ESPN. They can put it on ESPN U, Classic, 360, whatever. Road games are subject to the home team's TV deal. For example, all Notre Dame home games are on NBC. The SEC has a deal similar to the ACC where CBS, ESPN and Raycom are all involved. The MAC has a deal with ESPN, so the Kent State game was their property. Outside of the first two weeks of the season and non-Saturday matchups, most games are selected two weeks prior to kickoff. Even with that window, there is a tentative schedule produced in advance with built in contigencies ("if X beats Y, then the X-Z game will be on ESPN at noon"). These schedules are built around ratings, not records or rankings. However, records and rankings influence ratings. For example, BC and Clemson both bring certain fans to the table regardless of record. That baseline assures some TV coverage. If both teams are playing well you can draw in casual college football fans. If one team is in the dumps it drags ratings. Kent State -- ESPN U: When BC agreed to play Kent State, the game was probably going to be the Thursday before Labor Day at Kent State on ESPN 2. Then the Browns/Cleveland got involved and wanted the game played in Cleveland on Saturday night. ESPN/ESPN 2 had better options so we were moved to ESPN U. If not for BC's involvement, this game is not even carried on TV. Georgia Tech -- Raycom. Decided before the season. Both teams were likely to be unranked so ESPN passed. 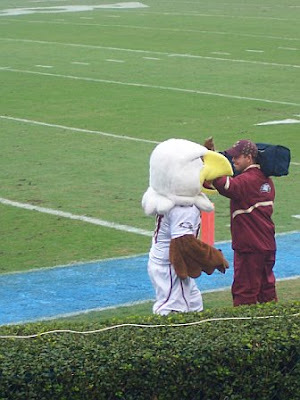 Raycom jumped at the chance to have BC back on their schedule after two seasons without Eagles football. Central Florida -- ESPN U. Decided after the Georgia Tech loss. This is where momentum and perception come into play. If BC beats Georgia Tech and enters the polls earlier in the season, this game might have been on ESPN or ESPN 2. Rhode Island -- ESPN 360. This is the one game where the ESPN deal hurts fans. If ESPN doesn't hold on to the rights, NESN or another New England broadcaster could have picked this up. It occasionally happened when we played the "good for New England" game as members of the Big East. NC State -- Raycom. This is where the Raycom love and the underperforming opponent come into play. If NC State had a better record ESPN would have grabbed this for the "TOB vs. BC" angle. Raycom gladly took it and the game performed well for them. Virginia Tech -- ESPN 2. When we are good and facing a good team we get primetime spots on national networks. North Carolina -- Raycom. This is where the two weeks scheduling hurts. I bet that ESPN/ABC selected the Virginia Tech-Florida State game assuming the Hokies would beat us. And even with our win, it could be argued that VT-FSU is a matchup with broader appeal. Raycom is happy...they get BC again. Clemson -- ESPN U. Clemson is in a nose dive now. If they were ranked this game would be on one of the bigger networks. As for the rest of the schedule. Notre Dame and Florida State will get good coverage. Maryland and Wake depend on how we play. If we remain ranked and at the top of the division those games will be on ESPN/ABC. When you step back, the whole system seems overly complicated. But diehards should be happy. We are in an age where every game is accessible from anywhere in the country. That is an improvement over just five years ago when I'd often be stuck listening to the radio stream online and periodically getting dropped or buffered during the broadcast. The key for all BC fans is to get ESPN U. ESPN just signed the SEC to a deal that froze out Raycom. I predict they will do the same with the ACC. Once that happens everything will stay within the ESPN family. BC released the media guide for the basketball team. Here is the affiliate list for the BC-UNC game. Steve Martin and Doc Walker will call the game. Get ready for plenty of "Raja," "Brice" and cheeseburger mentions from the good doctor. The Globe/Boston.com has not updated its college page in months. Someone finally noticed once their dated story on Toal became very ironic. Dr. Saturday thinks the ACC has taken on a surrealist vibe. Herzy won defensive player of the week honors. CBS Sports is getting on the BC bandwagon. Mass running back Alex Scyocurka has interest in BC. When the schedule first came out, I never thought the Clemson game would be relegated to ESPN U. For those who tailgate you get the 3:30 slot (which is nice). Unsure of how the ACC tiebreakers work? HD explains it. Dudley started out slow, but impressed during summer league play. There's a bottleneck at the top of my ballot. It should shake out over the next month. I am still keeping BC lower than they should be for fear of a jinx. For those who don't care for my ballot, remember this is a weird mix of on the field accomplishments and who I think is the better team...oh, and I sort of throw each ballot together without a ton of thought. Dropped Out: Virginia Tech (#11), North Carolina (#18), Michigan State (#19), Wake Forest (#21), Missouri (#22).